Interview with Carlos Matos & Lucas Cantu from Tezontle Studio. 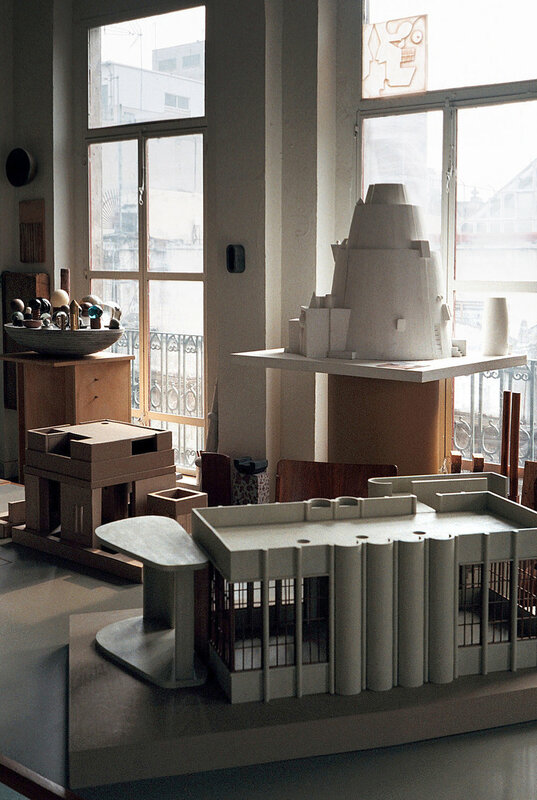 1) When was Tezontle Studio founded and how did it come together as both an Architecture and Art studio? Matos: Tezontle happened in a pretty seamless way. I met Lucas through a friend in some bar and we got talking about El Centro Histórico (downtown area in Mexico City) and the idea of setting up a space to share amongst us and potentially other people. The following week we met and began scouting spaces and that went on for almost a year. We saw loads and loads of spaces but they were near impossible to rent. It is quite common in Centro that a lot of the owners of buildings would rather have them empty or lease them only for storage. But we were quite patient. We had that going for us. A year passed and nothing materialized. But we kept meeting once a week. As we kept meeting once a week, this got us into many intense conversations about our explorations in the area, its future development, its forgotten or even neglected condition as an archeological site, and also how we could make use of the infinite resources that Centro had to offer. Not long after we began scouting the area, we started to collaborate. Lucas first invited me to do an abstract art pavilion at Music Festival, NRMAL. Lucas started NRMAL about ten years ago in Monterrey, and this was the festival’s 3rd edition in DF. We had a limited budget and little time to execute but we managed to build a couple of tall tents that would host the festival’s merch shop, a 20min tattoo cabin and a hidden tiny space with a selection of video art curated by Bikini Wax. The whole place worked as a refuge from the crowds. It was a quick and spontaneous first exercise but also very rich; it wasn't necessarily architecture but rather a type of interaction or happening. I think we still work with this in mind. We try not to worry if something is art or architecture but whether it triggers an experience or a feeling. That has always been the main objective for us. 2) Your work is clearly influenced by the Mexican culture and its outstanding historic artifacts, that also feed into your choice of materials. However, your work is also strikingly minimalistic, and almost brutalist. How would you describe this aesthetic relationship? Matos & Lucas: We are fascinated by Mexico’s history and artistic heritage—specifically the Pre-Hispanic era and Mid-Century Modernism. We like to think that there is a bit of both manifesting in our work. We really admire Goeritz, Federico Silva, Carlos Merida, Juan O’ Gorman, Diego Rivera and many others that re-appropriated Pre-Hispanic aesthetics through abstraction. In a way we are only trying continue their footsteps by re-interpreting spatial gestures or material explorations we feel moved by. It's been mostly an intuitive process coming out of genuine curiosity about the complexity of Mexican identity. 3) For someone who is not so familiar with sculpture or construction materials, what is tezontle and why did you decide to name yourselves like so? Matos & Lucas: Tezontle is the Nahuátl name for a reddish volcanic rock found in Central Mexico. We mainly thought the word was beautiful. But another, deeper reason we chose the name Tezontle is the material—a continuous thread that unfurls throughout the history of construction in Mexico. From the Pre-Hispanic temples of conquered Tenochtitlán and the colonial cathedrals lifted from their rubble, to the ornamental claddings in modernist period and its use as aggregate in concrete or simply gravel. Tezontle has always been there. Matos & Lucas: The project we feel most proud of in terms of end result and experience is our intervention of Richard Neutra’s VDL House (in Silverlake, Los Angeles). We were invited to stay in the house for almost a month and settle in pretty much as Neutra left it. LA author Aris Janigian wrote a text to which we then had to respond with an intervention in the roof pavilion of the house. The text narrates the story of a couple living an apocalyptic version of LA sheltered in their fragile pavilion. Los Angeles is in flames and there are clashes between citizens and illegal immigrants because of raids and mass deportations. Our response to the text was to convert the modernist glass cube into a protective bunker. 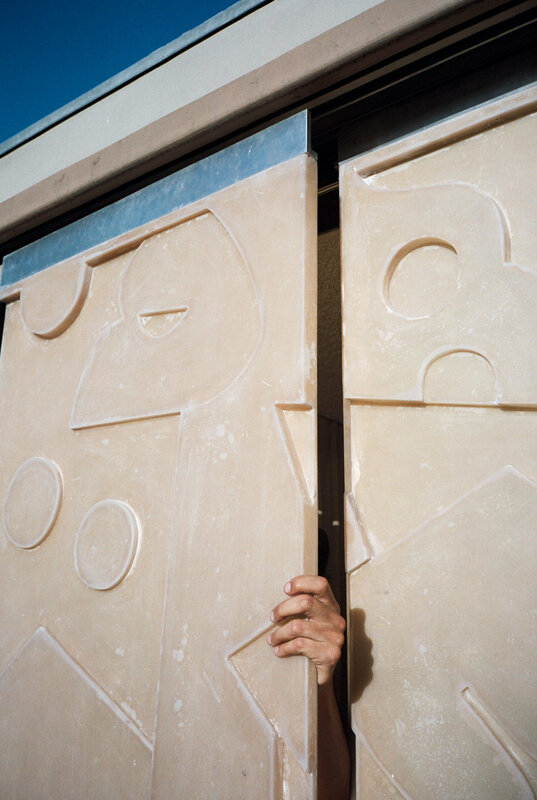 We shuttered the windows with fiberglass panels that were, at the same time, re-modulated replicas of Carlos Merida’s murals for a multifamily housing Juarez in Mexico City. The building had collapsed in the earthquake of 85. The murals depicted mythical Pre-Hispanic battles of which resembled in an abstract form the narrative of the text. The whole process was very intuitive and perhaps even a bit far fetched, conceptually. But it was an amazing experience to intervene a Los Angeles’ case study house and convert it into an homage to Mexican Modern Muralism. Somehow everything ended up making sense and we got to experience the house longer than planned. On September 19 (2017) our mural got stuck at the airport in Mexico City due to an earthquake that freakishly happened 32 years years later exactly on the same day the original Merida murals collapsed. 5) I had the chance to see your participating artworks at Untitled Fair with Peana Projects during Miami Art Basel 2017. Tell us about the pieces you exhibited and your overall experience taking part in the fair. 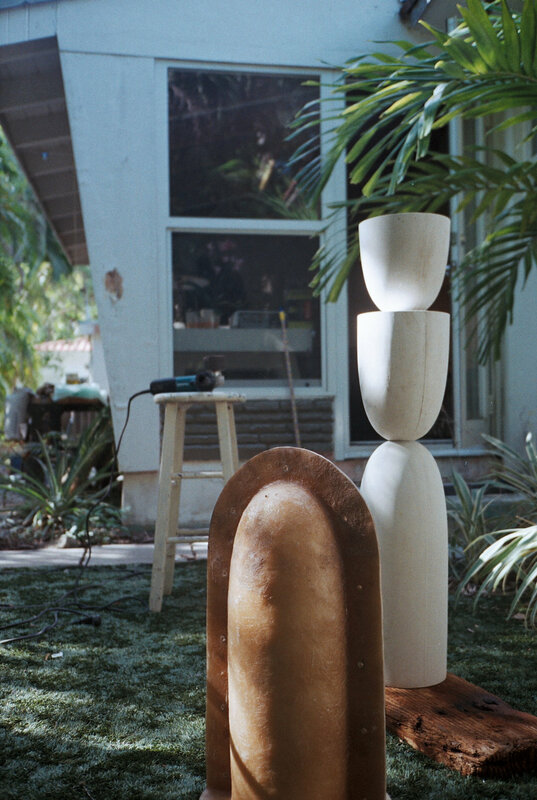 Matos & Lucas: We had to be quite practical with what we were going to show at Untitled Miami as we were producing most of the pieces in a 10 day residency just before art week. So we decided to bring a couple of form-works from Mexico and see what else came up during our stay. We did smaller and more manageable versions of ‘Torso’ and ‘Abrazo’, a small maquette assembled with found objects called ‘Bird’s House’ and a last minute improvised piece called ‘Pigeon’ that ended up being our favorite. Overall we had a lovely experience (thanks to our host!) and hope we will be back for art week at the end of this year. 6) Let’s talk Mexico City and your beautiful working space located in the center of the city. What’s a normal day like in your studio? Matos & Lucas: We are currently about 8-10 people. From the very beginning we were looking to create a space that we wouldn't want to leave and that would facilitate creativity, a sort of fun house. We took inspiration from working spaces like Eames’ 901 space in Los Angeles, Atelier Van Lieshout’s warehouse in Rotterdam, Tom Sach’s studio in NY to name a few. The space is slowly taking a life of its own, independently of the studio and the work we produce we have a lot of friends that have started activating it with different projects involving other artists, music, food, performance, etc. 7) Do you play any music while you're working? If so, name some of your favorite tracks, artists or albums. Matos: Yes, we always have music playing in the studio. Regular working hours we play a lot of ambient, like Brian Eno or Nils Frahm. We like to contrast the atmosphere of the studio with the hectic noise of centro outside. Lucas also collects vinyls and has a great collection of Pre-Hispanic tunes and cumbia rebajada that we play at parties. 8) During Zona Maco this year, you hosted a sound session with Sol Oosel. Do you plan to keep doing more sessions with other musicians? Matos & Lucas: Definitely, we have a couple more coming up this year. We are really inspired by a venue in London called Cafe Oto that hosts casual performances of sound art and experimental music and we often fantasize of having a comparable space here in Mexico. A place solely dedicated to noise and experimentation. 9) And lastly, do you have any upcoming exhibitions or exciting projects you would like to share with us? Matos & Lucas: We are currently working on a series of architectural projects in Oaxaca and the Caribbean that involve a fair deal of explorations into abstract architecture, vernacular construction methods and large scale sculpture. One is a ceremonial center in the small town of Uh May near Valladolid, and the other is a small case study house near Casa Wabi in Puerto Escondido that is a part of a collective master plan amongst many architects we admire. 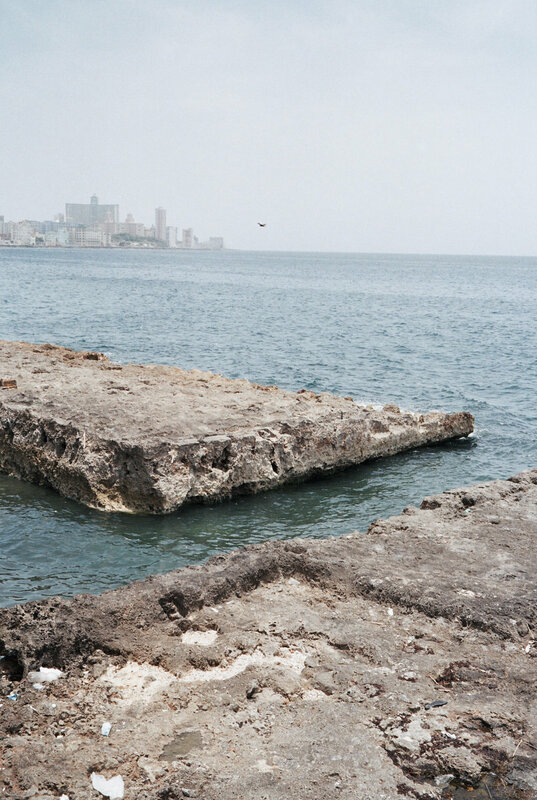 We are also really excited to about next year’s Habana Biennial where we’ve been invited to construct a folly in the rocks of the emblematic Malecón. It’s going to be quite a challenge to work there and intervene a context that has remained practically untouched for decades. As for exhibitions, we will be showcasing some small pieces in a collective show called Prima Materia in New York City. To see more of their work visit @tezontle_studio.